This week our 15 to 1 victim is another guest from the big island who is over for a visit (Coburgs on Friday 21st March). He is a man of taste, elegance and refinement, all to the background of breaks and scratches. The megastar of Chap Hop, it’s…it says down the bottom (and the top you fool!). Sat on a chair in my study. Beatbox by The Art Of Noise. All the way through every England batting display this winter. For all the money from major record labels to be given to people who make music. Yes. hungover. The horse in front soiled itself. I shall not be doing it again. ‘Tis Acid Ragtime’. A Chapstep compilation on CHBC coming out in a few months. It’s dance music for chaps and chapettes. Sartorial elegance and just enough booze to ‘take the edge off’. No, I only plug shamefully. Buy my latest long player ‘Can’t Stop, Shan’t Stop’ please. Terribly sorry. I woiuld only use it, then wish I’d chosen someone else. 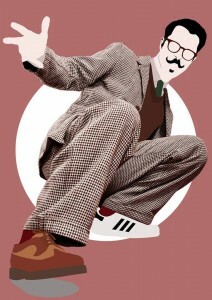 I Am Mr.B The Gentleman Rhymer. Chap-Hop Superstar. Mr. B plays Coburgs, Friday 21st March for Galactic Ents with support from Jay Foreman. Tickets £5 adv or £7 on the door.